Posted on May 12, 2014, 10:10 am, by Google Webmaster Central, under crawling and indexing, hreflang, localization. If you are doing business in more than one country or targeting different languages, we recommend having separate sites or sections with specific content on each URLs targeted for individual countries or languages. For instance one page for US and english-speaking visitors, and a different page for France and french-speaking users. While we have information on handling multi-regional and multilingual sites, the homepage can be a bit special. This post will help you create the right homepage on your website to serve the appropriate content to users depending on their language and location. Show everyone the same content. Serve content depending on users’ localization and language. Let’s have a look at each in detail. In this scenario, you decide to serve specific content for one given country and language on your homepage / generic URL (http://www.example.com). This content will be available to anyone who accesses that URL directly in their browser or those who search for that URL specifically. As mentioned above, all country & language versions should also be accessible on their own unique URLs. Note: You can show a banner on your page to suggest a more appropriate version to users from other locations or with different language settings. In this configuration, you decide to serve a country selector page on your homepage / generic URL and to let users choose which content they want to see depending on country and language. All users who type in that URL can access the same page. Note: Think about redirecting users for whom you do not have a specific version. For instance, French-speaking users on a website that has English, Spanish and Chinese versions. Show them the content that you consider the most appropriate. 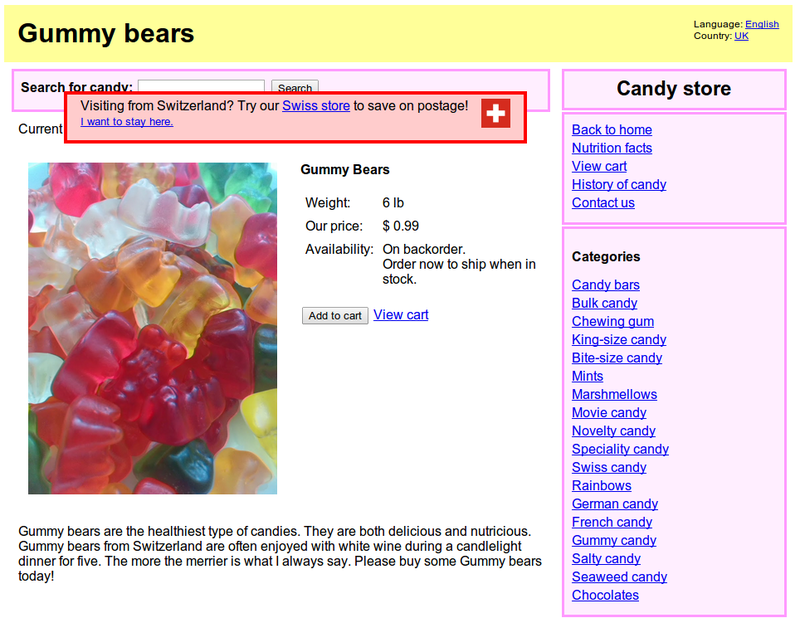 Are accessible for Googlebot’s crawling and indexing: do not block the crawling or indexing of your localized pages. Always allow users to switch local version or language: you can do that using a drop down menu for instance. Reminder: As mentioned in the beginning, remember that you must have separate URLs for each country and language version. Remember to annotate all your pages – whatever method you choose. This will greatly help search engines to show the right results to your users. Country selector pages and redirecting or dynamically serving homepages should all use the x-default hreflang, which was specifically designed for auto-redirecting homepages and country selectors. Your annotations should be self-referential. Page A should use rel-alternate-hreflang annotation linking to itself. You can specify the rel-alternate-hreflang annotations in the HTTP header, in the head section of the HTML, or in a sitemap file. We strongly recommend that you choose only one way to implement the annotations, in order to avoid inconsistent signals and errors. The value of the hreflang attribute must be in ISO 639-1 format for the language, and in ISO 3166-1 Alpha 2 format for the region. Specifying only the region is not supported. 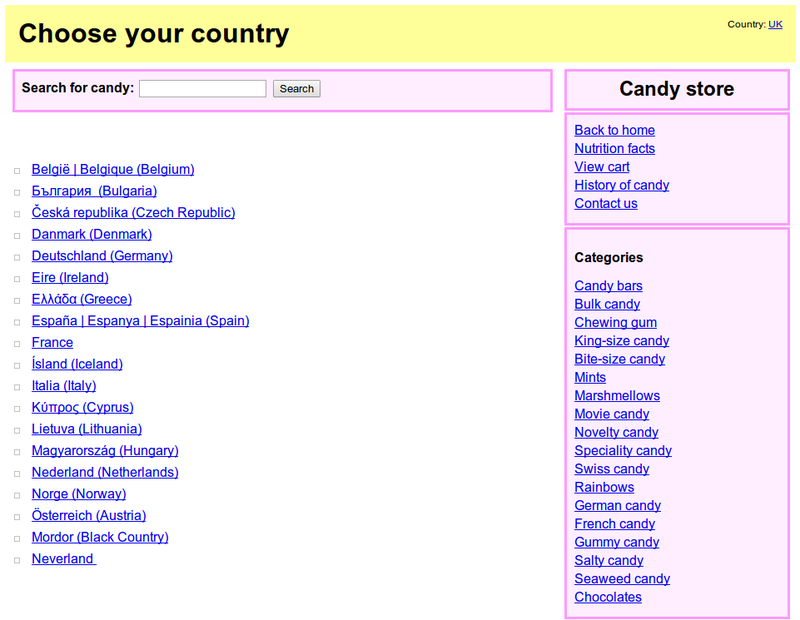 If you wish to configure your site only for a country, use the geotargeting feature in Webmaster Tools. Following these recommendations will help us better understand your localized content and serve more relevant results to your users in our search results. As always, if you have any questions or feedback, please tell us in the internationalization Webmaster Help Forum. Posted on April 10, 2013, 9:00 am, by Google Webmaster Central, under hreflang, localization. The homepages of multinational and multilingual websites are sometimes configured to point visitors to localized pages, either via redirects or by changing the content to reflect the user’s language. Today we’ll introduce a new rel-alternate-hreflang annotation that the webmaster can use to specify such homepages that is supported by both Google and Yandex. The new x-default hreflang attribute value signals to our algorithms that this page doesn’t target any specific language or locale and is the default page when no other page is better suited. For example, it would be the page our algorithms try to show French-speaking searchers worldwide or English-speaking searchers on google.ca. The same annotation applies for homepages that dynamically alter their contents based on a user’s perceived geolocation or the Accept-Language headers. The x-default hreflang value signals to our algorithms that such a page doesn’t target a specific language or locale. As always, if you have any questions or feedback, please tell us in the Internationalization Webmaster Help Forum.